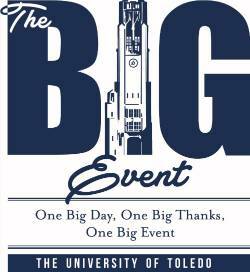 Spending time with seniors, visiting patients in the hospital, helping with spring cleanup — these are a few of the assignments on the list for The University of Toledo’s Big Event. The largest student-run service project will take place Saturday, March 23. More than 1,000 University students, faculty, staff and alumni are expected to pitch in this year across the Toledo area. “It is inspiring to see participants come together from all backgrounds to make a difference in the city we all have the privilege to call home during our time at the University,” Tara Roeder, a senior majoring in accounting and director of the Big Event, said. Volunteers can check in starting at 9 a.m. at the Student Recreation Center. An opening ceremony will take place at 10 a.m. and feature two speakers: Ken Leslie, founder of Veterans Matter and 1 Matters, and University alumnus Matt Rubin, president and CEO of Crane Development Ltd. in Toledo, who was involved with the Big Event when he was a student. The vision for the Big Event was to give University students a chance to show their appreciation and give back to surrounding communities by completing service projects. University volunteers will be assigned to more than 50 locations in the area, according to Dylan Vonderhuevel, a senior majoring in premed biology and director of job sites for the Big Event. Locations include the University’s Stranahan Arboretum to clean up damage sustained during the ice storm; Toledo Bikes! to help repair recycled bicycles at the nonprofit organization; Sunset House Retirement Home to talk to seniors and play games; and Mercy Children’s Hospital to visit patients. “I realize I’ve been very lucky to grow up with the family I have and be able to attend college, so I have always wanted to help others who have been less fortunate,” Vonderhuevel said. “I hope participants leave this event inspired and with a newfound or renewed passion for service,” Roeder said. Anyone who wishes to volunteer can sign up on the Big Event registration website through Friday, March 22, and at the event Saturday morning. This entry was posted on Wednesday, March 20th, 2019 at 3:54 am and is filed under Alumni, Events, News, UToday .